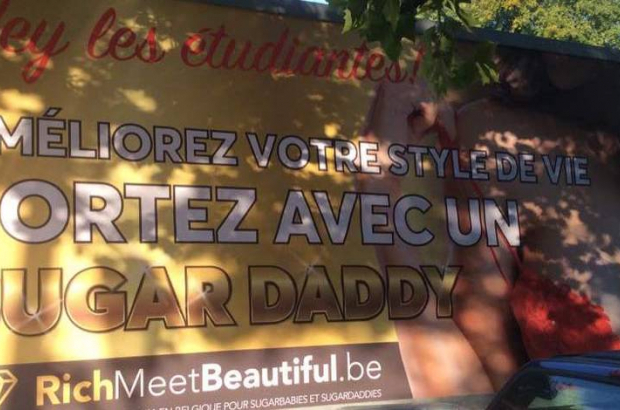 The founder of a website that invited female students in Brussels to find a "sugar daddy" is facing a €40,000 fine and a six-month suspended prison sentence for inciting prostitution. Billboard ads for Rich Meet Beautiful were mounted on the trailer of a car in September 2007 and driven around the VUB and ULB university campuses, with the slogan: "Student debt? Go out with a sugar daddy." The site, in its own words, is aimed at "attractive people looking for the finer things in life. They get to experience a luxurious lifestyle, and meet wealthy people on a regular basis". The "sugar daddies" registered on the site are described as "successful men who know what they want. They’re driven, and enjoy attractive company by their side." As well as a possible €40,000 fine for the site's creator, Norwegian businessman Sigurd Vedal, prosecutors are also calling for his company, Digisec Limited, to be fined €250,000. His defence lawyers argued that Rich Meet Beautiful was simply a dating site. Opaline Meunier, president of Francophone student union Unécof, said the site sought to exploit students in a difficult financial or psychological situation.